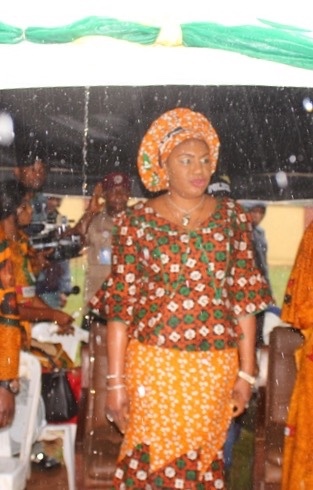 In open display of commitment to the welfare of the less privileged, the wife of Governor of Anambra State, and founder of Caring Family Enhancement Initiative (CAFE), Chief (Mrs.) Ebelechukwu Obiano (Osodieme) braved the heavy rains Tuesday to empower 990 indigent women, widows, physically challenged and children in Ihiala and Ekwusigo Local Government Areas. Osodieme personally distributed goodies to the 990 persons under torrential rains at Ihiala and Ozubulu as part of her ongoing empowerment tour of the twenty-one local government areas in Anambra State. The 990 beneficiaries made up of forty persons per community include 770 persons from the fourteen communities in Ihiala and 220 persons from the four communities in Ekwusigo Local Areas respectively. Further breakdown of the beneficiaries show that 180 indigent women, 180 widows, 270 physically challenged persons, 270 aged women and 70 children received various items like bags of rice, clothing for the aged, school bags containing Math set and exercise books for children, treated mosquito nets, and stipend to ameliorate their plight. Speaking to the crowd assembled at the respective Councils Areas, Osodieme said that the objective of the empowerment is to reach out to the less privileged and ensure that every onye Anambra is given a sense of belonging. She reaffirmed her commitment to the training and empowerment of women, widows and youths to be meaningfully engaged and be productive to the society. Osodieme further urged the beneficiaries to register with her NGO, CAFÉ to be trained in vocations like tailoring, bakery and confectionery or even beauty therapy and computer/telephone repairs etc, stressing that after training they would be given the necessary equipment and funds to start up their chosen enterprise, adding that students who have passed the requirements for higher institution can also be part of the programme. In a welcome remark, the Transition Committee Chairman of Ekwusigo, Engr Ikenna Ofodeme, said that Osodieme has set the standards for selfless service to mankind which has placed her in the hearts of ndi Anambra and as mother to all. His Ihiala Local Government counterpart, Barr Ifeanyichukwu Odimegwu also praised Osodieme for her charitable works. Other Speakers at the event also applauded Osodieme's goodwill in giving lease of life to the indigent women and widows, the physically challenged and the aged in the society. The tour attracted top government functionaries, including Commissioner for Social Welfare, Children and Women Affairs, Lady Ndidi Mezue, the Chairman and Chief Executive Officer of Anambra Signage and Advertising Agency, ANSAA, Chief Jude Emecheta, General Manager of Awka Capital Territory Development Authority, ACTDA, Venerable Amaechi Okwuosa, Anambra State Chairman of All Progressives Grand Alliance, APGA, Sir Norbert Obi, with other party stalwarts, traditional rulers, amongst others.